One of my favourite Cold Chillin albums right here. Every debut album from a Juice Crew member is a slammer, this oneâ€™s no exception. 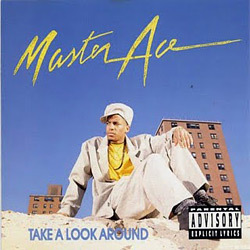 Since his second album, MastER Ace turned his name into MastA Ace and was accompanied by his Incorporation. On this album heâ€™s backed by his Action Posse, with DJ Steady Pace, a.o. The production is by Marley Marl (who else? ), so expect a lot of James Brown samples. Master Ace's lyrics are cool, braggadocios ('rip emcees like a paper bag' ) but mostly educatin ('I have to write songs and teach'). The album hits off with a banger; 'Music Man' is a dope track with a funky bass and a dazzling guitar sample. 'I Got Ta' reflects the social engagement of the rapper: the song's is like a testimony of moral duties with girl-friendly and black positivism. A Juice Crew moment is 'Me and the Biz', with its crazy funky Cymande sample and a feature of fellow label- and crew mate The Diabolical Biz Markie. A highlight on this album is 'Other Side of Town', a mad funky track with lots of irony and sarcasm. Master Ace criticizes the bad situation of the black man in the ghetto (here: Brooklyn) by emphasizin the social differences in New York. His hometown is again subject matter in "Brooklyn Battles", it has a smooth , delicious and famous Eddie Kendricks sample. The Music Manâ€™s describin the street fights 'stop playin Shaft, cuz life ain't a movie scene' on his block and proves to be one hell of a storyteller. Social activism, party and battle rhymes are the main ingredients of this album. Therefore, it pretty much shows us all aspects of hip-hop lyricism. Add the funky Marley Marl production to it, and youâ€™ll gather this album is essential.